Question Something wrong with (my) Nvidia Telemetry Container/Client? Hi everyone, I need help with Nvidia graphic driver problem. Is there something wrong with this software? Cuz this is the second time it failed to install after I updated the driver (others software related to Nvidia driver are fine). This also happened in the previous version I updated. Im'ma bit worried about this so, does anyone know what's the matter with this software? Does anyone have a permanent/temporary solution for this problem? BTW I'm using Acer Nitro 5 with GeForce GTX 1050. 1) Using the DDU to uninstall the GPU driver in safe mode first. 2) After that, reinstal the nvidia GPU driver again to see what happens. I don't like updating graphics drivers for laptops unless it's from the laptop vendor support site. There are way too many cases when that causes issues. 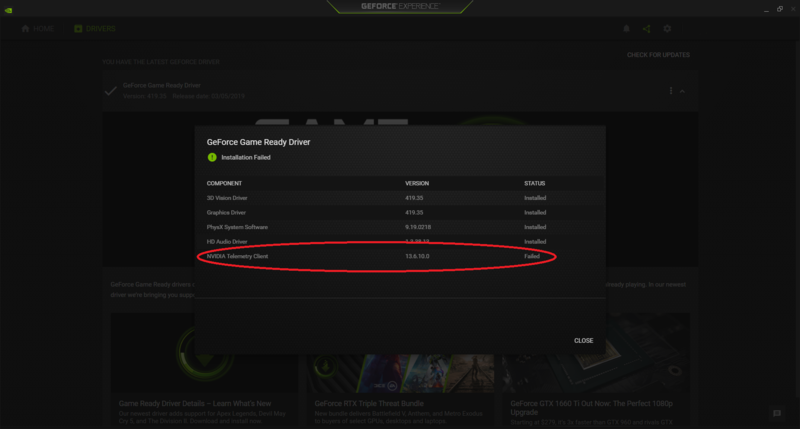 Both nVidia and AMD have warnings that the laptop drivers are provided but without support. 2) After that, reinstall the Nvidia GPU driver again to see what happens. Just to confirm, do this method ever working for you? Does this problem ever happen to you too? And what do you mean by "in safe mode first" or.. how should I do in safe mode? The method works for me and anybody, if the problem related to the GPU driver. When you use the DDU to uninstall the driver, you should do it under the safe mode, how to https://support.microsoft.com/en-us/help/12376/windows-10-start-your-pc-in-safe-mode if you want you can do it without go into the safe mode too. Question What is wrong with gpu rates? Wrong flash XFX R9 270; Can I use a SPI flash programmer?